We are delighted to share some of the outcomes reported by our grant recipients. For a full listing of grant awards from 2015-16 visit this page. Max Fraser (Ph.D. Candidate in History at Yale University) was awarded funds for “The Southern Appalachian Migration Archive,” an ongoing oral history project devoted to preserving the accounts of natives of southern Appalachia who migrated to the industrial Midwest during the middle decades of the twentieth century. Click here for details. John Grammer (Professor of English and Director of the School of Letters, Sewanee) and April Alvarez (Administrator for the School of Letters, Sewanee) were awarded funds for “Regional Writing, the Sense of Place, and the Rural Appalachian High School.” Funds helped to support a visit to Sewanee by East Tennessee novelist Amy Greene (author of Bloodroot and Long Man), including a reading to the college community, and a writing workshop for students from Franklin and Grundy County High Schools. Click here for details. Andrew Thompson (Postdoctoral Fellow in Environmental Ethics at Sewanee’s School of Theology) was awarded funds for “Finding Common Ground: Ecological Pluralism on the Domain.” This workshop brought together University and community participants, and is expected to contribute to management decisions about the domain and to a wider scholarly conversation on value pluralism in ecology. Click here for details. Andrew Thompson (Postdoctoral Fellow in Environmental Ethics at Sewanee’s School of Theology) was awarded funds to develop a class called “Christian Social Ethics in Local Context.” The course will include at least one week focus on the local history of social actions and will also include a discussion of framing as it relates to moral decision making in community. Click here for details. Michael Thompson (former Fellow at the Center for Religion and Environment), John Gatta (William B. Kenan Jr. Professor of English), and Robin Gottfried (Director of the Center for Religion and the Environment), all from Sewanee, received a grant to develop and oversee the presentation at Sewanee of a dual-purpose symposium on “Imaginative Education: Cultivating A Sense of Place” in late August of 2015. 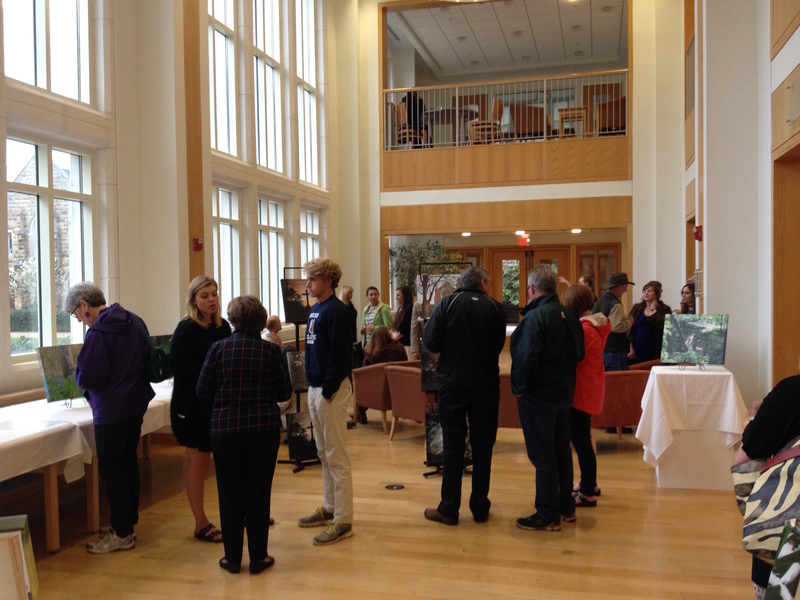 Offered in collaboration with the Berry Center of New Castle, Kentucky, the Symposium contributed to the start of the FYP course on “Discovering a Sense of Place.” Click here for details. Maya Sandler (Doctoral student in the History of Science and Medicine at Yale University) was awarded funds for a research project called, “Care Beyond the Coalfields,” examining the transfer of the Miners’ Memorial Hospital Association from the United Mine Workers of America to the Appalachian Regional Healthcare, Inc. in 1963. Click here for details. Paige Schneider (Visiting Assistant Professor of Politics at Sewanee) and Emily Partin (Family Resource Center Director for Grundy County Schools and Director of Discover Together) were awarded funds for “Grundy County Post Secondary Experience Survey.” This project aimed to gather data on the post-secondary experiences of young adults in Grundy County. Interviews with Grundy County High School alumni will generate data that can inform evaluations of existing programs at the high school, and the structure and content of future initiatives aimed at enhancing post-secondary resources and supports on the Mountain. Click here for details. Sid Brown (Professor of Religious Studies and Chair of Religious Studies, Sewanee) was awarded funds to develop a course, “Practicing Place.” In this class,students examine theories of place and ritual—particularly of a fairly recently developed Buddhist community in Southern Appalachia—and thus develop lenses through which to view all the rituals of their lives. Click here for details.